Winter is usually when horses are not as active than in warmer months. In the summertime, horse owners assume that their horse’s water consumption needs to increase since it’s hot out and the horse is more likely to sweat. It’s a big misconception that in the winter, horses don’t need as much water. This misconception could lead to major trouble for horses in colder weather. The reason why it’s important to keep your horse hydrated in the winter is that the dry forage they are eating like hay cubes contains less than 10 percent water. This is much different than the summer pasture they consume that has a much higher water content which is over 50% more. So your horse should be drinking more in colder weather than in the summer otherwise they could get a condition called impaction colics. The average 1,000-pound horse requires about 24 quarts of water consumption daily or just over five gallons. A great way to encourage your horse to drink in the winter is with electrolytes. Olsen’s Grain has electrolytes and salt blocks in-stock for this reason. Add these to their feed and ensure they meet the required daily water intake. 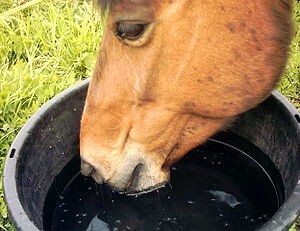 Another way to ensure your horse is drinking is to give them warm water. In cold weather especially freezing weather, the water in their buckets get very cold and they will not likely drink freezing water. To combat this try heated buckets or heated water tanks to keep water at drinking temperatures. Just make sure that wires are properly connected and not a danger to your horses. This entry was posted on Monday, November 19th, 2018 at 5:40 pm	and is filed under Horse, News & Updates. You can follow any responses to this entry through the RSS 2.0 feed. Both comments and pings are currently closed.